Saturday- Another day at work. It was fairly quiet with two of us working. One thing I have noticed this year is that we are receiving a lot of patients from the VA. Looks like they finally have their act together. If they cannot handle the volume of patients they are sending them to the local hospitals for immediate care. Sunday- Bob watched the Redskins lose again. It was a quiet day at work with two of us working. Monday- Wow, another quiet day at work. We had a meeting where they showed us how to self schedule. The period for scheduling opens up on Wednesday, so I will have to schedule when I get back to work on Thursday. My co-worker, Heidi, who trained me last year, and has been my preceptor, turned in her resignation today. I knew it was coming as we have become friends over the last year. Annette’s last day is Dec. 24. Heidi’s is the 26th. She starts her new job on Dec. 29 as the Director of Case Management at one of the insurance companies. In addition, the one Social Worker who works the floor has also resigned. So that leave me as the only full-time person. My contract goes through Feb, 7, so I am going to see how things go to decide whether I want to renew! Tuesday- We decided to go look at new cars. Our plan had been to keep the CRV until 2017, but we hate this car and both of us are sitting on pillows! The seats are very uncomfortable. Neither of our hips are doing well with this car. We are limited on the cars we can purchase, as we have to buy a car that can be towed 4 wheels down. We are looking at three different models. Our first stop was at the Ford dealership. We looked at the 2014 Ford Edge. It is a very nice car. Linda and Mike have one and they really like theirs. We did the test drive and they offered us almost twice what we expected for the CRV . Thinking…. We stopped at In-n-Out Burger for lunch, then went to the Jeep dealer, where we looked at a Jeep Cherokee. It has a lot of nice features, one of which is a ‘cooler’seat. The leather seats have heaters, but the Jeep also has a seat cooler. Pardon the pun, but it was a cool feature! My bum got so cold I had to turn it off! We also liked the electronics, but the seats made my hip hurt. Plus it was noisy. We returned home and took a short nap. Bob’s phone rang during our nap and woke us up. So we investigated the cars some more. I also finished the Christmas cards. Then we left to go to Scottsdale to dinner with friends Glenda and Bob Hamburg who are in town for a couple of days. I worked with Glenda in California. Wednesday- I was off for a 10:30 hair appointment. Well, that was a first for me! When I walked in, Mitra, the gal who does my hair just looked at me like I was crazy. MaryAnne and Linda had both gone to her. I was not happy with my last cut or color, but had decided to give her another chance. It turned out that both Linda and MaryAnne had not been happy with her and told her so. They knew that I had not been happy, So she had cancelled my appointment, after they both called her to complain. So she told me she was not taking that abuse. Huh? Okay, I walked back out. We stopped at Lowes and looked at back splashes. We decided on one and Bob is going to put it up this week. We returned home and took a nap. We went out to dinner at Dillon’s, a local BBQ placed and the meals were great. It is always fun when the eight of us get together. Thursday- Back to work again. I tried to do the self scheduling and there were no shifts. They were supposed to add shifts, but still none there. 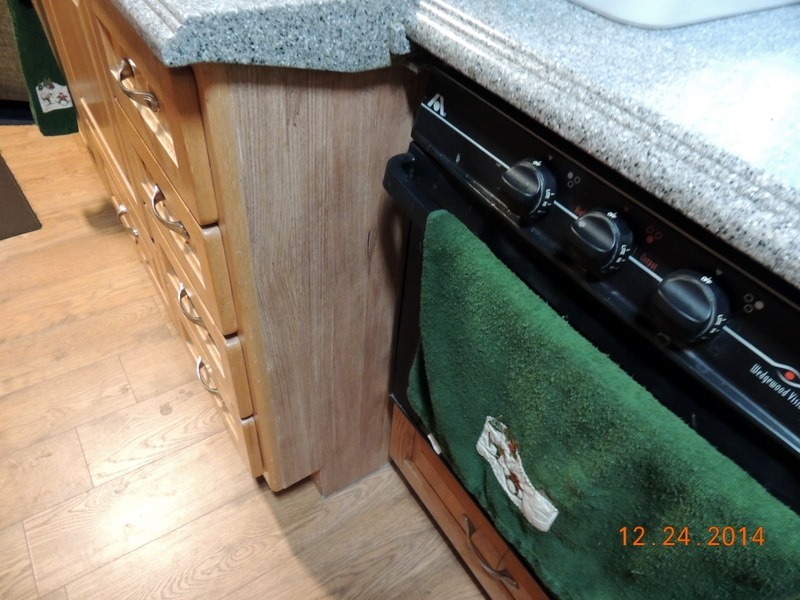 Bob ran around getting everything we need for the back splash and to fix the end of our cabinet. The previous owners had put some hooks there and when we took the hooks off the covering came off. So Bob bought some tape and put that on today. Then he put on color and it looks just like it looked like when we bought the MH, except no hooks! We did not like the hooks as they were in the way and we did not use them. 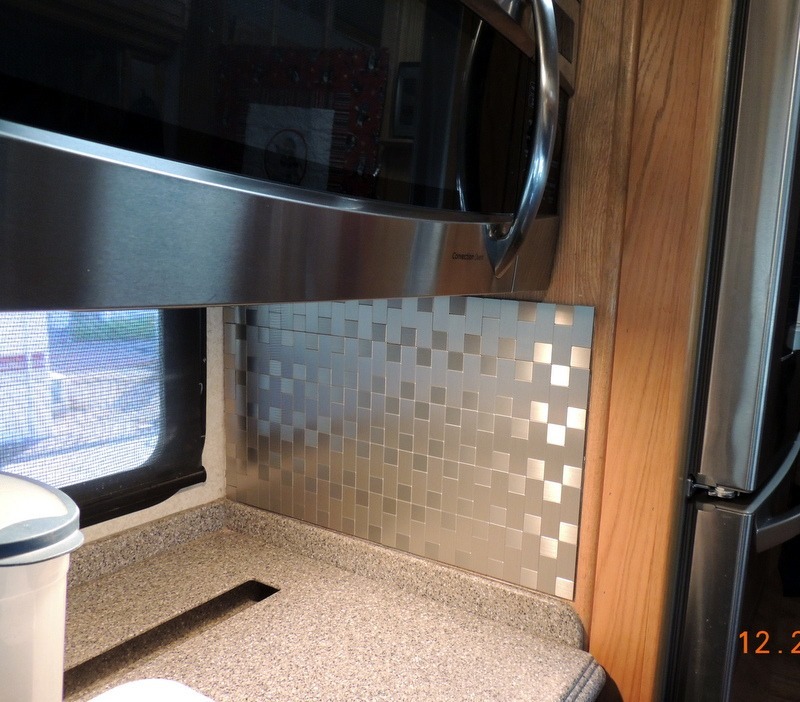 Friday- Bob installed the backsplash. I worked and it was a pretty busy day. Someone had made the determination that they were adding a new task to our busy job description. We are now to submit patients to the MDCC( that is the person who determines if the patient can change status from Observation to Inpatient). Well, they dumped this on us without any training. I had asked one of the ER Case Managers for the steps, so I had a vague idea on how to do this. The MDCC who is at our hospital came to me and told me to task a patient to him for review. He said to just go ahead and send it for transfer as he was going to recommend the change for the patient status to inpatient. He was not very nice about it and wanted me to jump right on it, so I did. Then his written determination was ‘observation’. This can cost the hospital thousands of dollars in revenue. I was not a happy camper! We had our party/cookie exchange,and he was there. So I went to him and said that I had a bone to pick with him. He knew right away what I was talking about. He apologized and said that it was his fault, not mine and that I was not in any trouble. ( I won’t trust him again and will wait, no matter what he says, until he puts it in writing!) . So I went upstairs and resent the information to Patient Financial Services, to undo what I had done. 44 minutes later, the doctors changed their minds, AGAIN, and the patient went Inpatient status! Frustrating! I had no doubt about the patient needing to be made inpatient when first told to make the change, because the patient was very ill. I went to the hospitalist and glared at him, without saying a word. He caught on really quickly that I was angry, and he apologized profusely to me for all the confusion, which made me feel a little better. Luckily, PFS had not gotten around to making the second change and all ended up well.I certainly learned a lesson! Don’t trust what the MD’s say, make them put it in writing and make them fume until they do!